Electric power plants—the biggest water users in the country—may be on track to receive a jolt to the system. Thermoelectric plants are responsible for over 85 percent of Illinois’ freshwater withdrawals. The water pulled from streams and rivers is used to create steam to run turbines and as a coolant to combat the high temperatures that come with power generation. A nd researchers at the University of Illinois at Urbana-Champaign say that supplying treated, non-potable water to power plants may be able to meet that demand even in times of drought. Stillwell and her graduate student Zachary Barker used algorithmic models to analyze six Chicago-area coal, gas and nuclear power plants near the Stickney Water Reclamation Plant. They investigated the amount of treated wastewater the power plants would need, the structural feasibility of piping water directly to the plant and what effects this redirection would have on downstream waters. Their calculations confirmed that one of the biggest feasibility indicators is the type of cooling system used by the plant: open or closed loop. In an open-loop system, water is taken from a nearby waterway and then dis- charged back into the source at a higher temperature. The water in a closed-loop system flows circularly between the plant and a cooling tower where a portion is released through evaporation. 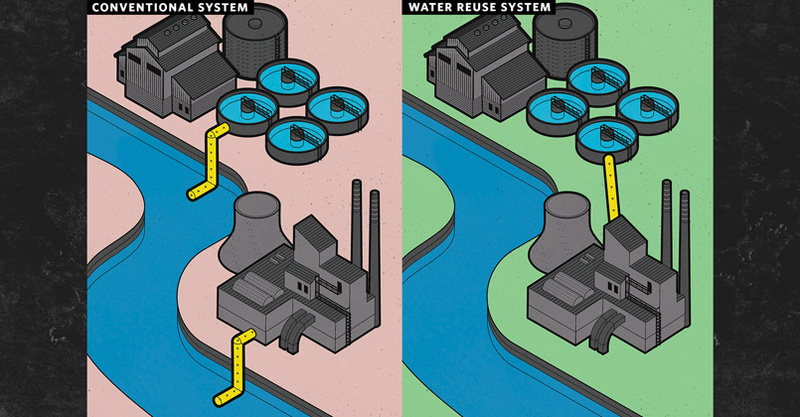 Water reuse schemes like the one modeled by Stillwell and Barker are only possible in closed-loop systems. Because reclaimed water systems consume more water, though, the researchers had concerns that recirculating and evaporating water in the Chicago area might lower flows enough to hamper barge traffic downstream in the Illinois River. Stillwell and Barker admit that Chicago is one of the most complex systems in which to conduct research of this kind and say it’s difficult to make recommendations based on the results. Their findings instead serve as a model to quantifiably understand what would be necessary should Stickney and the power plants choose to pursue a water reuse system. “What we can say is that there’s a significant underutilized water resource that can support economic development,” Stillwell added.